The Cow Parade started in 1998 in Zurich. Stockholm (2004), Geneva (2005), among others succumbed to the folly. The cow fever has arrived in Athens in 2006 form the 8th of May to the middle of September. 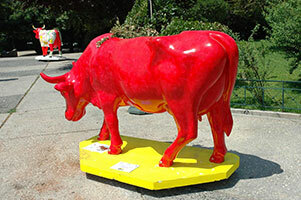 The Geneva Cow Parade can also be seen in my website "The colourful Dream".